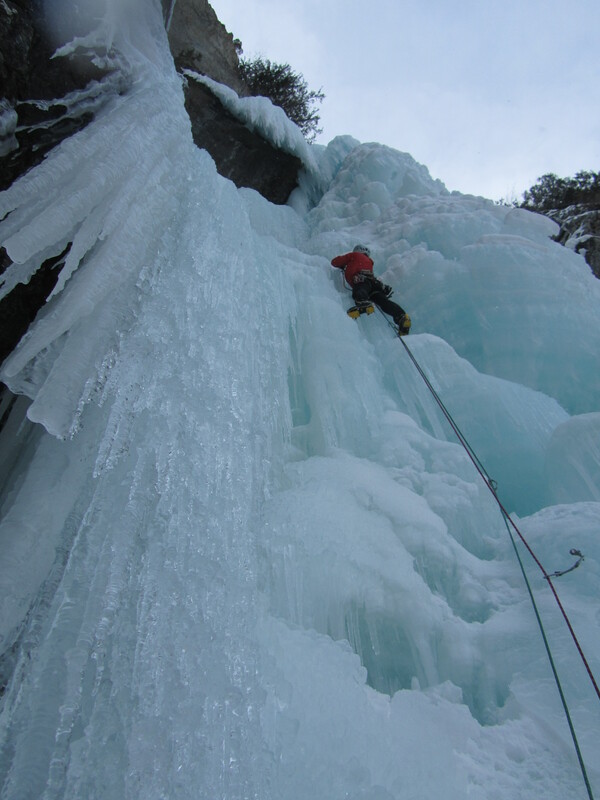 If backcountry skiing is a bit silly, then ice climbing is utterly perverse. Old Dogs, New Picks. Photo: Jesse Mason. • Driving back and forth along the Duffey Lake Road and Bridge River Canyon while humming and hawing about what to climb. • Crossing creeks and rivers. We crossed Cayoosh Creek on an ice dam and used hip waders to cross the Bridge River. One week before, I’d crossed the Green River to climb at Suicide Bluffs via a permanent tyrolean traverse (all of these methods are far preferable to this technique I used last year). Jesse Mason climbing the second pitch of Shriek of the Sheep, in the Bridge River Canyon near Lillooet. • Crazy ice formations. The ice mushrooms looming over Jesse in the above photo are car-sized. We also encountered huge, breakable sheets of egg-shell ice and the ubiquitous masses of unconsolidated, wet icicles. • Greasy Breakfasts. I don’t need much of an excuse to be unhealthy, but when you’re going to be slogging around in the cold, it’s not hard to justify ingesting a few thousand calories of eggs and bacon first thing in the morning. The Reynolds in Lillooet is a great place for this, although I was recently somewhat offended when the waitress labeled me “city folk” simply because I asked for milk in my coffee. Shriek of the Sheep. Photo: Henrik Hinkkala. • Bailing. Admittedly, I bail off routes of all types in all sorts of places. However, I’m particularly terrified of the prospect of the route that I’m climbing collapsing with me on it. Even after having slogged across snow-dusted talus and up a steep drainage of frozen dirt, it wasn’t a hard a decision for us bail once the sun came out and started baking the hanging daggers that we’d hoped to climb. • Getting soaking wet. I don’t actually own a gore-tex jacket; in winter I climb almost exclusively in a wind-shell (I’ve been using this one lately and it’s great, but not perfect). However, if there was ever a good time to wear a waterproof jacket, it would be while climbing ice on the West Coast in March. At least it’s not very cold out. 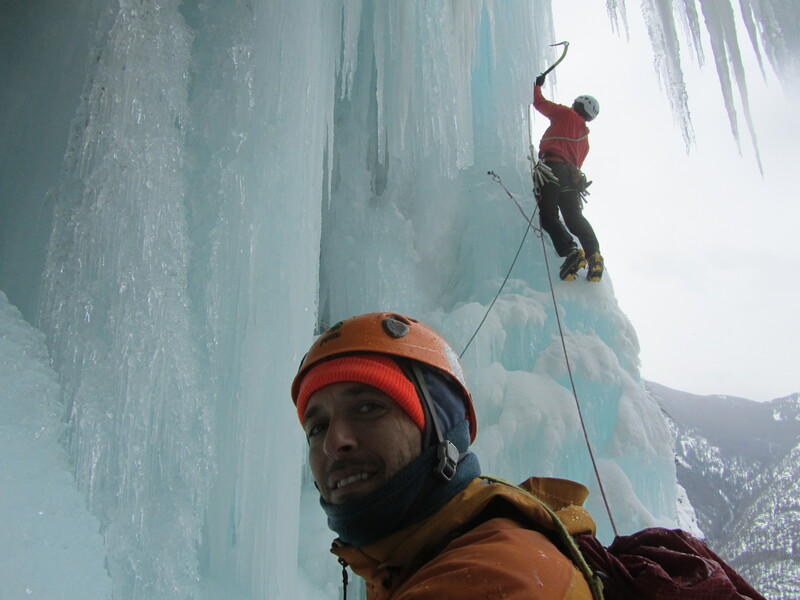 I think that this photograph sums up the West Coast ice climbing experience. Photo: Henrik Hinkkala. 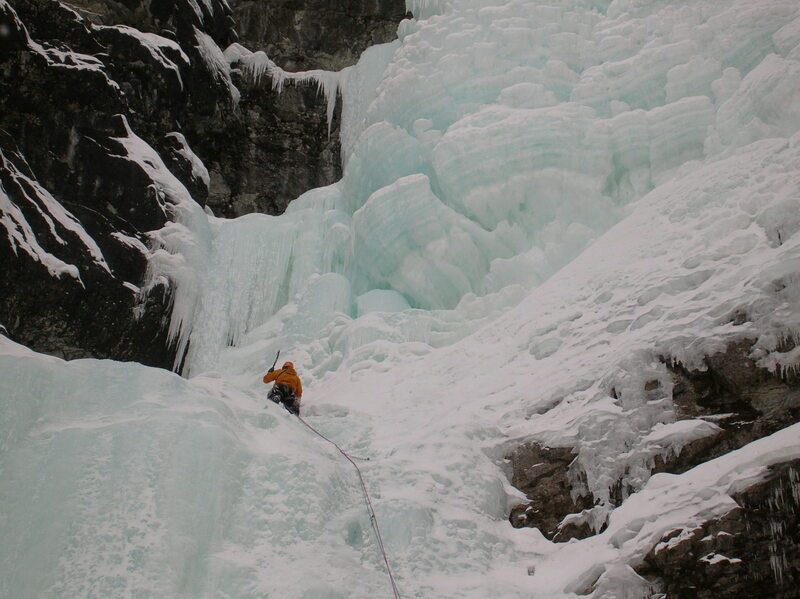 It’s fashionable to claim that climbing pure ice is easy, and admittedly there’s some truth to this if you’ve got strong arms and a good head (and especially if you live in an ice climbing destination where you can wait until a route has seen a few hundred ascents before hooking your way up it). 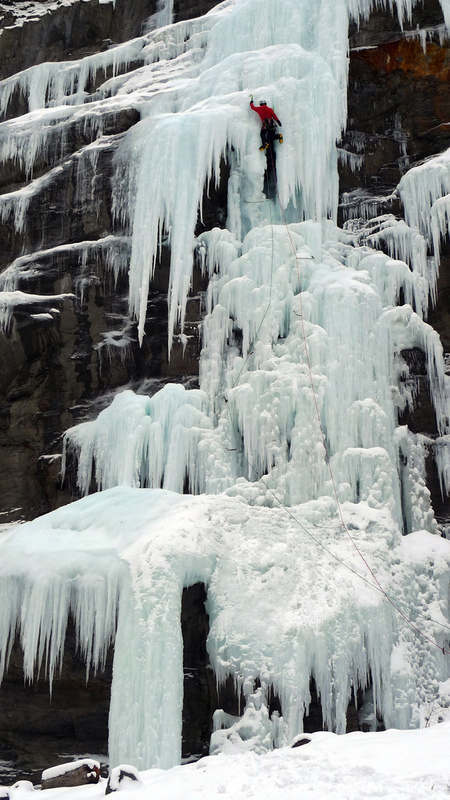 As you may have gathered, ice climbing can also be cold, wet and scary. So what’s the appeal of doing something that’s easy but miserable? Certainly the appeal isn’t widespread: we were the only climbers in the whole Bridge River Canyon on a weekend when every pullout on the Duffey Lake Road was packed with carloads of skiers. That in itself is not a bad reason to ice climb on the West Coast. Besides, it’s healthy to do something a little perverse every so often.